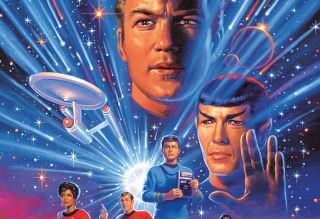 Fans of the original "Star Trek" series know that the show's opening monologue mentions the Enterprise's "five year mission" - and now a new IDW comic book will explore the final year of that journey, according to The Hollywood Reporter. "Star Trek: Year Five" will feature a succession of creators, including writers Brandon Easton, Jody Houser, and Jim McCann, while co-writers Colin Kelly and Jackson Lanzing will pen the first arc. According to Lanzing, Year Five is "a vital, hard-hitting, character-focused look at Captain Kirk on his last year in command." "[Star Trek: Year Five] will have huge ripple effects, from the outbreak of war in the Alpha Quadrant to an unprecedented strain of trust with Spock," Lanzing explained. "We'll turn a mirror on modern society, just as [the original television series] did in the 1960s, and go boldly towards meaningful, heartfelt stories." "Star Trek: Year Five #1" will launch in April from IDW.